Disease management programs for peach and nectarine begin every year with control of leaf curl. In this article, we discuss some of the basic biology of leaf curl, as well as the methods used for its control. In a near future article, we’ll explore how the abiotic environment influences leaf curl development, and how climate change may be altering our management strategies. Biology. 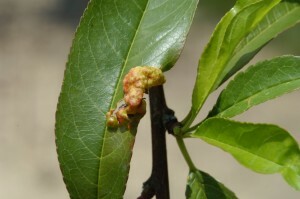 Peach and nectarine leaf curl is caused by the plant pathogenic fungus Taphrina deformans. In the eastern United States, leaf curl is typically not a difficult disease to control. However, if inoculum levels are high, environmental conditions favor infection, and/or control methods are sub-par, then severe defoliation and stunting can occur. Fruit infection, which results in the formation of irregular raised wrinkled areas on the fruit surface, is generally rare in occurrence. Taphrina deformans principally overwinters as spores on the bark surface; the pathogen may also be found in old infected leaves. Initial infection occurs during bud swell in late winter when spores are disseminated by water to buds with loose scales. Additional infection can occur between bud-break and petal fall. Once the pathogen enters leaf tissue, it stimulates rapid cell division and enlargement, resulting in thickened, curled, and puckered leaves (Figure). These “tumor-like” areas on the leaves often have a red discoloration. Eventually, the leaves drop or sometimes remain attached, turning brown. Control. A single fungicide spray in fall, after leaf drop, or in late winter just prior to bud-swell, will in most cases provide sufficient control. The recommended fungicides are ziram or chlorothalonil (Bravo, Echo, etc…). Both of these fungicides have provided near 100% control in studies on ‘Redgold’ nectarine at the Rutgers Agricultural Research & Extension Center, Bridgeton; non-treated trees had 39% bud infection. Ferbam is also considered effective, but was not included in the studies. In general, fixed copper products provide a fair level of control. For example, in the same study at RAREC, Champ Formula 2 at its highest rate (10 pts) provided 68% control. However, it is possible that newer copper formulations, such as Kocide 3000, Nordox, Cueva, or Badge X2 may be more effective. Additional data are needed for these newer coppers. 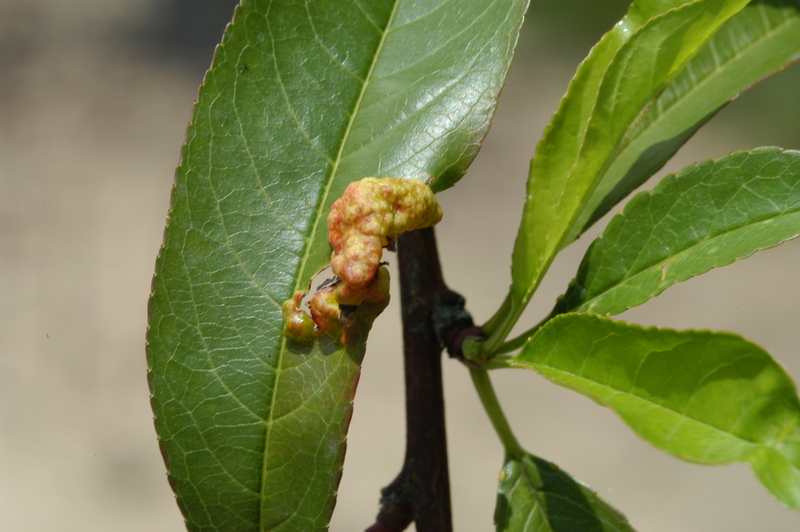 Assuming leaf curl has not been problematic in a particular orchard, copper fungicide / bactericides are the recommended material for bacterial spot susceptible cultivars. In this case, the copper efficacy should be adequate for the lower leaf curl risk while also helping to reduce epiphytic inoculum for bacterial spot. In this case, a pre-bud-swell rather than fall application is advisable so that the copper residue will be present as the trees advance into bloom.